Real-Time Stats from Google Analytics: Could we integrate the data with our UCSF Profiles activity stream and future dashboards? The “New Version” link is in the top right of Google Analytics. Real-Time reports are in the Dashboards tab (though they will move to the Home tab in the updated interface next week) . 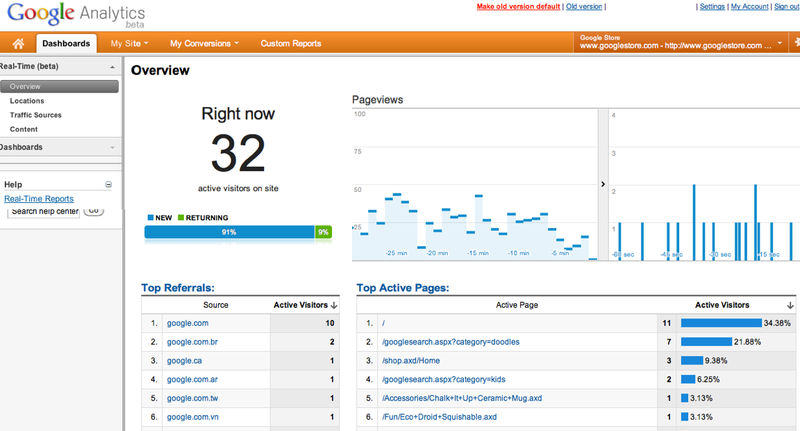 Google Analytics blog: What’s happening on your site right now? We might be able to get the data out of Google Analytics, but we can get it more easily out of our own server logs and generated Salesforce events, the way we are right now. That’s good to know. Thanks, Anirvan.